In today’s update, we will give you a summary of our last AnnoCast developer stream with Game Designer Natacha and UI Designer Jack. Grab a seat and see our completely overhauled UI, the City Attractiveness feature and the Zoo in action! Thanks to everyone who joined our last AnnoCast , it is awesome to see how engaged Union members discuss and chat with us during our livestream. 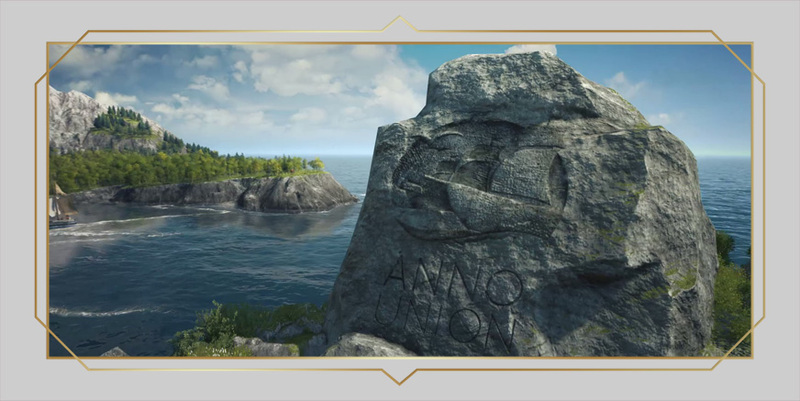 Our game developer streams provide a great opportunity to show you gameplay from the development version of Anno 1800 and this time, we put our big UI overhaul and the City Attractiveness feature in the limelight. A perfect moment for Game Designer Natacha to give us a tour through the zoo and to demonstrate how the new attractiveness feather offers a major gameplay addition to the Anno series. Even before our first episode of the AnnoCast, we asked you for screenshots and other community creations in order to decorate the streaming room. With the new streaming room, which was literally finished one day before we went live with AnnoCast 04, we can finally use your great screenshots and fan arts to decorate our wall. Speaking of community creations: as some very perceptive viewers accurately noticed, the island which we used for our stream is indeed the Community Island from GMExpresso! You can find out more details about the island here. Since our last episode, Anno 1800’s UI went through a major overhaul. Our UI Designer Khajag “Jack” Jabaghchourian not only demonstrated the new UI, he also talked about the relevance of a good UI design and why it is so important in a strategy game like Anno 1800. Being a major topic of AnnoCast 03, the traderoute menu was the perfect candidate to show you the visual improvements we added to the latest iteration of the UI. What do you think about the new UI overhaul and our artistic direction? Is Anno 1800’s UI and UX design something where you would like to share feedback or to learn more about in general? If you want to compare the new and old UI for yourself, you can check out AnnoCast 03 HERE. The Zoo is one of the huge construction projects for Anno 1800’s new City Attractiveness feature. Natacha Hentzien gave us not only a tour through her beautifully crafted tourist paradise, she also went with us to the zoo, showing of some of the common wildlife but also exotic species from far away. While you can sink hours in the highly customizable buildings, we also talked about ornaments, city hotspots and the new visitor harbour. Serving as the drop off point for tourists who want to explore your city, we also had to take care of a special visitor who decided to take root in our city. But there is a flipside to the industrial revolution, the soot blackened factories are not really something you would call a marvellous vista for tourists. Did you like the smoke effect of our factories? Are you a fan of the tourist visual feedback and the zoo project? Rivers and small lakes in the island would be awesome! Answer: We are currently working on it and hope to share some impressions pretty soon! Is the purple colour on the menu a players choice or is it always the same? Answer: There are currently no plans for a customizable UI colour scheme. However, the state of the UI shown during the stream still includes some older elements. The game UI is an ongoing project and with that, still subject to change for the next couple of month. We are really curious about any feedback regarding the UI so keep your questions and feedback coming! Is it possible to move buildings? The zoo is still missing a fence, are there any plans to add a fence to it? Answer: While there is currently no fence, we got a lot of feedback from the community and see what we can do! What does the Currency in the Public Moorings Interface mean? Answer: That is the current income earned by tourists visiting your city. Are we forced to make a pretty city and get tourists if we want the best modules/people? Answer: We will provide many different options to get new items. Attractiveness is only one way to get them and some are specific to the way you can acquire items. So don’t worry, you don’t have to aim for a high City Attractiveness rating to get your hands on the precious specialists. What happens when I suddenly tear down my zoo? Will people protest? Answer: The number of tourists visiting your city is determined by the attractiveness rating of your city. If it drops (because you reduce the modules in your zoo, swap out interesting for boring animals or create a new industrial district), a part of them will go back to the harbour and wait for the ferry to leave your island. They might change their mind if you provide new attractions, though. What is the max capacity for animals at the zoo? Or can I make the zoo as big as I want? Answer: With the zoo, customizability and creative freedom are of highest importance. You will be able to freely build and place as many modules as you like, display a variety of different animals and biomes and make use of city ornaments between the animal enclosures. How does it work with the rating for festivities and celebrations? I can’t see any points in that category on your island? Answer: If the overall happiness of your residence raises, they might return you the favour with celebrations. Furthermore, there are other events which can push your happiness greatly for a short amount of time, which also might result in your residence organizing festivities in your city. Will we be able to place every ornament, tree, etc individually (like in 1404) or is it random like in 2205(hope not) where u just draw a rectangle and the game places everything for u? Answer: You will have full control over what kind of ornament you want to place in your city. On Sunday, the 20th of May, we also had the premiere of our new Anno community stream: AnnoAfternoon! Anno community team member Seraxia and O5ighter decided to challenge their skills with an old classic and fan favourite: Anno 1404. They even managed to reach a sizeable population of patricians in their town Wolfshafen, as it was named by our community. In honour of most important trading partner, our first oriental settlement now bears the name “Al’s Summer Home” (since “Al Zahirs Summer Mansion” is a bit too long). A lot of questionable decisions – aside from naming conventions – were made, like placing a church in the oriental settlement instead of a mosque, as there was the hope that the Nomads would be happy with the choice. Have you watched the community stream? Feel free to discuss our new community show, share your thoughts and don’t forget to let us know if you would like to see more formats like this in the future. That was it for today’s community update, there is still a lot of work to do before some of our team members will find some well deserved rest during the upcoming bank holiday weekend in Germany. We will be back next week with a new DevBlog and further Union updates. Next Post Union Update: Next vote ahead! One of the things I really enjoyed in Anno 2205 was the map ‘Wildwater bay’. Will there be similar maps in anno 1800, where your ‘Island’ seems to be part of a bigger continent not shown on the map? I quite liked the new UI., thought I would like to know whether the UI look will change to respect the industrialisation. Think of the normal UI look for pre-industrialisation and a more modern look with an option to switch between them after they got unlocked. Those UI look could for example be unlocked by upgrading buildings. To keep it simple, it could just be a color change. Thought this would also be a nice feature. Some illegal zoo visitors without a fence and it is up to you to decide whether you want to spend a larger amount of money on that fence or if the small loss by illegal visitors is ok for you. I mean, that you earn money with the zoo is already implemented with the money you get from tourists, so it wouldn’t be that complicated I suppose. Just make the fence a module for the zoo. I swear I need this game as soon as possible. And more Anno games in the future!